May | 2017 | H.A.W.K.S. 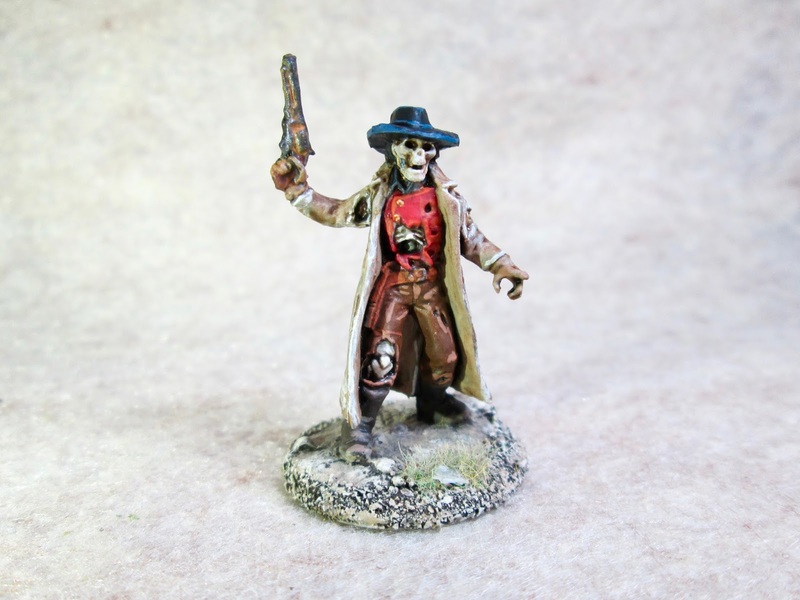 This past week I painted the Undead Outlaw figure from the Bones 2, Savage Worlds set. I began by giving the figure a wash with heavily thinned Reaper “Grey Liner” using a wet brush. 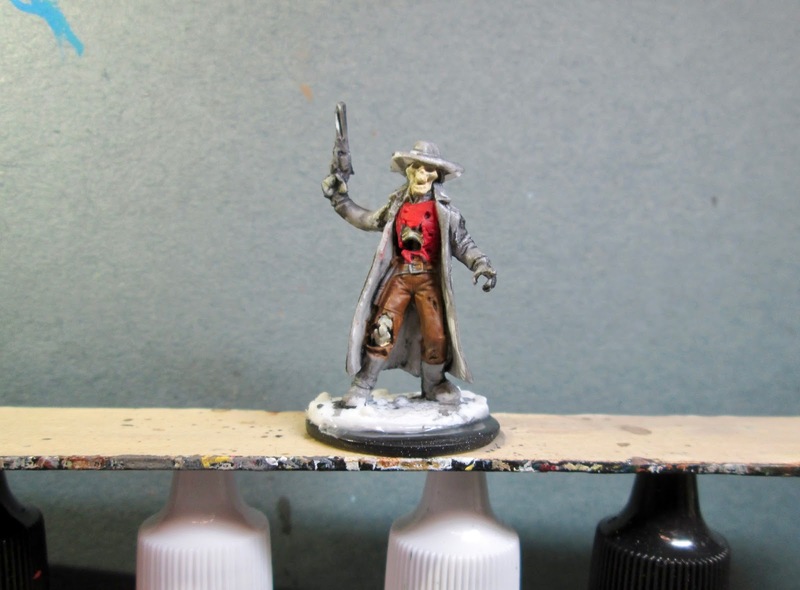 When the wash was dry, I painted the shirt with Ceramcoat “Opaque Red”, and the pants with Reaper MSP “Turkey Brown”. 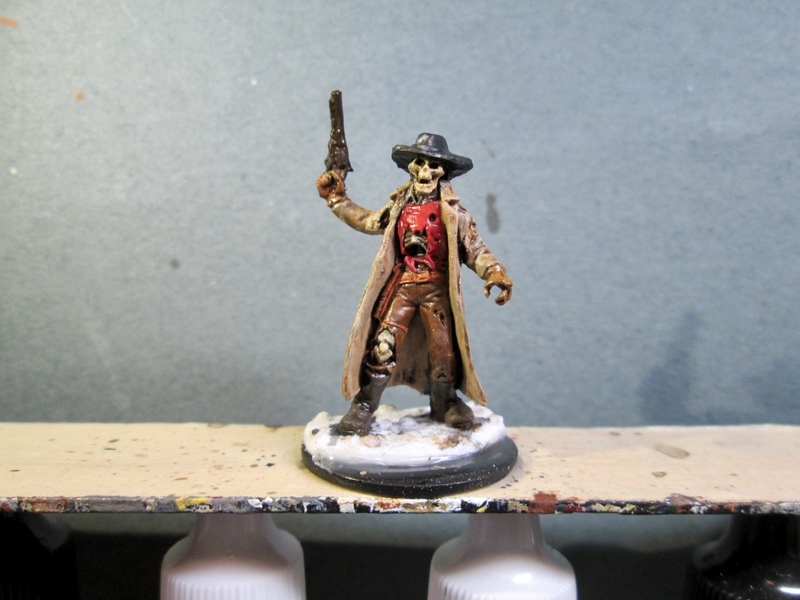 I then painted the skull and exposed bones with Americana “Antique White”. 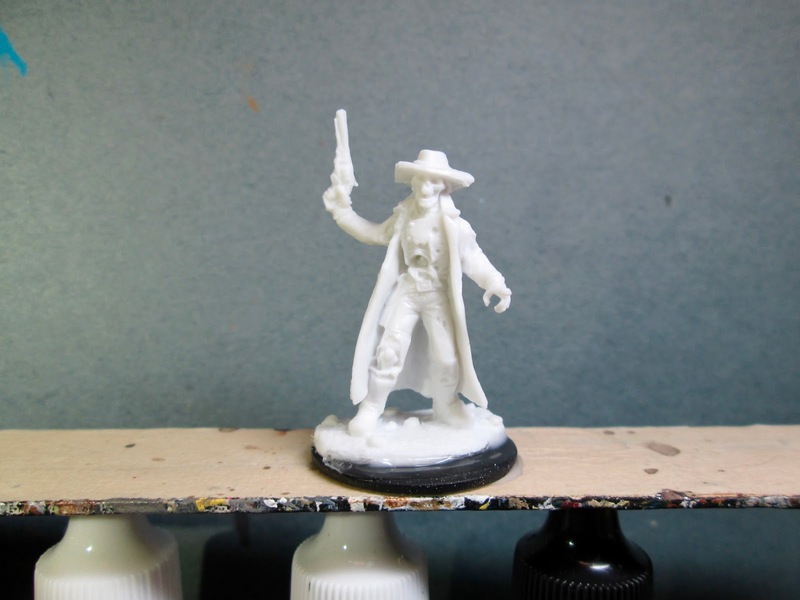 Next, I painted the duster coat with Americana “Khaki Tan”, and then the boots with Americana “Charcoal Grey”. After that, I painted his gloves with Accent “Mustard Seed”, and the handle of the gun with Crafter’s Acrylic “Cinnamon Brown”. I then painted the belt and holster with Americana “Terra Cotta”, and then let the figure dry for a while. 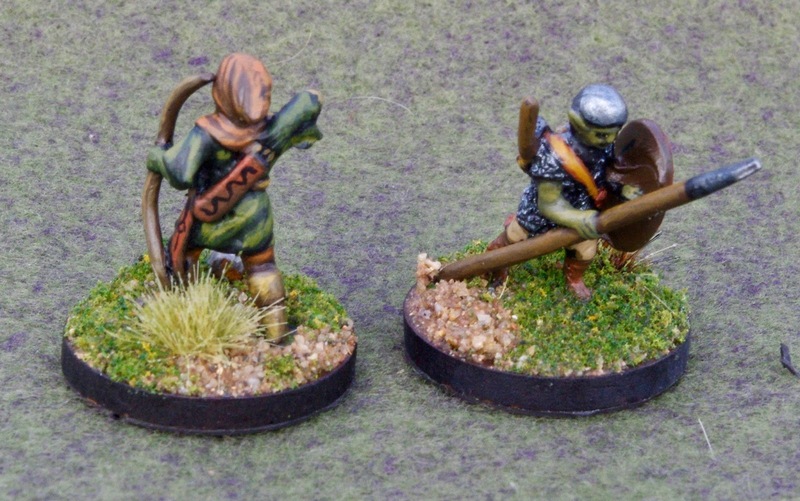 Afterwards, I gave the entire figure a wash with Citadel “Agrax Earthshade” wash, using a wet brush. When the wash was dry, I painted the metal parts of the gun with Ceramcoat “Walnut”, and his hat, shirt collar, and hair with Black. Next, I highlighted the head and other areas of exposed bones with White. I then highlighted his red shirt with Crafter’s Acrylic “Orange Spice”, and his pants with Americana “Sable Brown”. I highlighted his boots with Americana “Mississippi Mud”, and his hat with “Citadel "The Fang”. 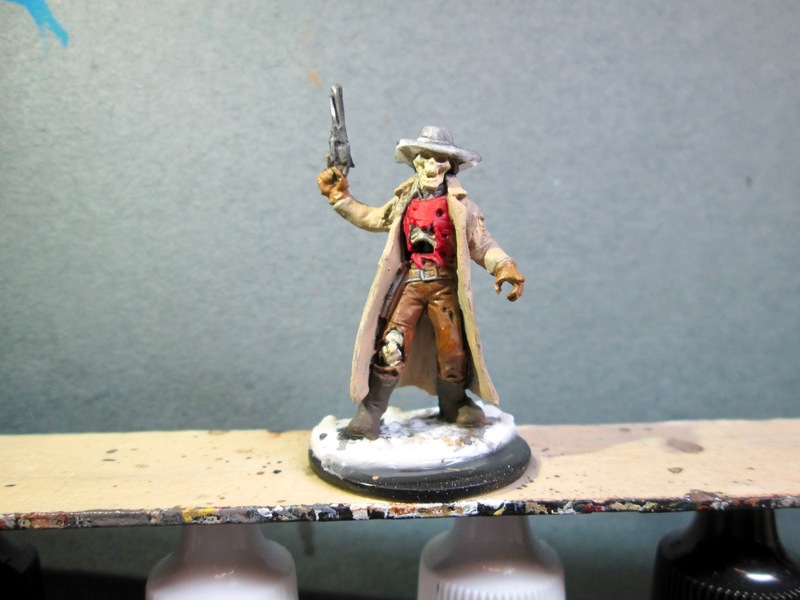 After that, I gave the metal parts of his gun a wash with thinned Accent “Golden Oxide” paint; and while that wash was drying I highlighted his duster coat with Americana “Bleached Sand” and his gloves with Folk Art “Butter Pecan”. I then painted his buttons with Ceramcoat “Bronze”, and then did his belt buckle with Folk Art Metallics “Gunmetal Grey”. I then did a light drybrushing on the metal parts of the gun with the “Gunmetal Grey”. When I was done painting the figure, I used some white glue to glue a little sand to the base. When this was dry, I painted the sand, and the figure’s integral base, with the “Charcoal Grey”, and when the paint was dry, I drybrushed the base and sand with some Americana “Territorial Beige”, then some of the “Antique White”, and lastly the “Bleached Sand”. I’m really happy with how he turned out. I’m not exactly sure what I will use him for, but it’s a fun and cool figure to have in the collection. And, it’s another Bones 2 figure completed as I anxiously wait for my Bones 3 shipping notice. After taking a year off from Huzzah in 2016 (for my son’s college graduation), I made the trip again this year. Huzzah takes place in Portland, Maine, at a hotel near the airport, which makes flying very practical. This year my significant other was up for a road trip and some shopping at the nearby L.L. Bean outlet, so I was able to pack my 40mm Renaissance figures to be half of a game run with my long-time collaborator Ross Macfarlane. In some future year, though, I may find myself limited to staging a game that is air-transportable, but that’s a topic for a different post. 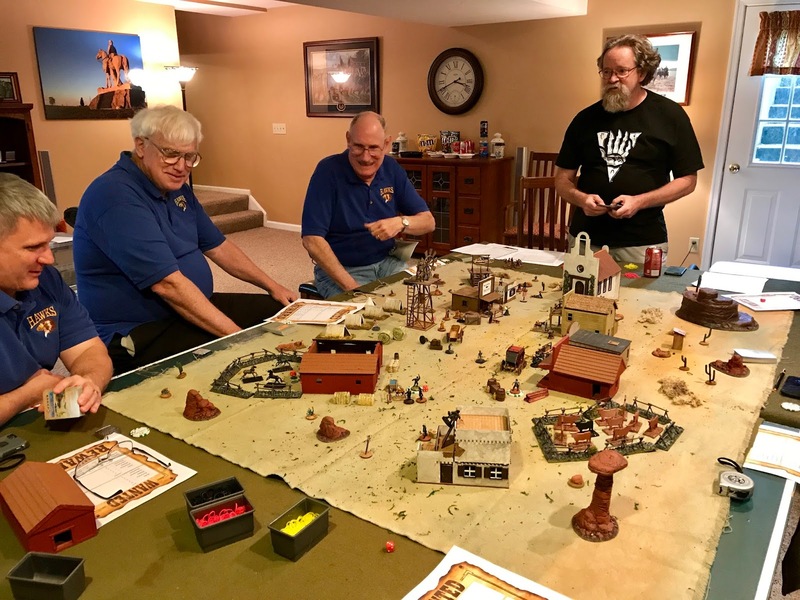 The general stress of life has been a little high this year, so I was fortunate that Ross was up to the task of doing most of the planning for our game, as well as acting as the convention liaison for the contingent of HAWKs who came up for the weekend. As the convention approached, I have been working on something else entirely (1/72 fantasy), so Ross dipped into his vast collection of miniatures and came up with a 1/72 Hordes of the Things army so that we’d have an alternative pick up game. Irene and I reached Portland on Thursday evening after an uneventful drive. Official gaming at Huzzah starts after lunch on Friday, so there was a little time to relax and make ready. When Ross arrived, we grabbed a table for a quick review game of the 40mm Renaissance rules we use, and then moved on to our first official game. 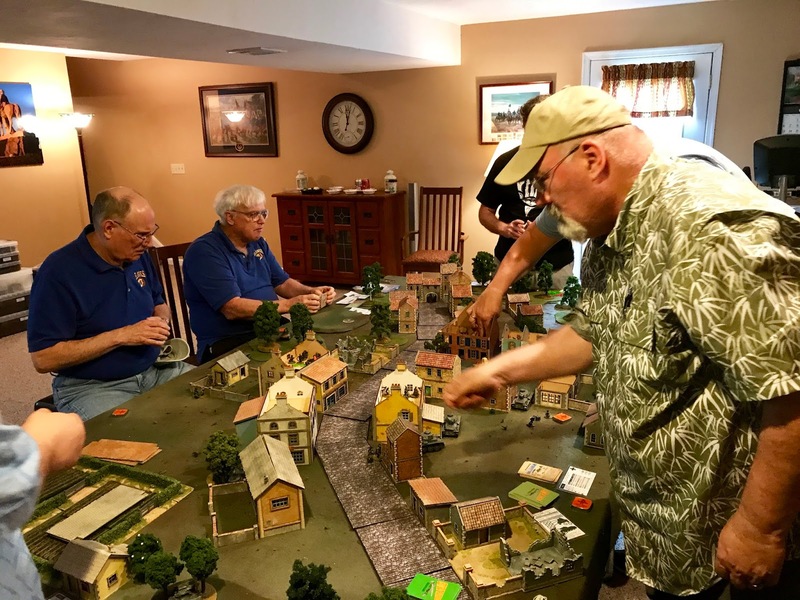 We were both in a 54mm English Civil War game, using plastic figures from A Call to Arms and the Very Civile Actions rules from The Perfect Captain. 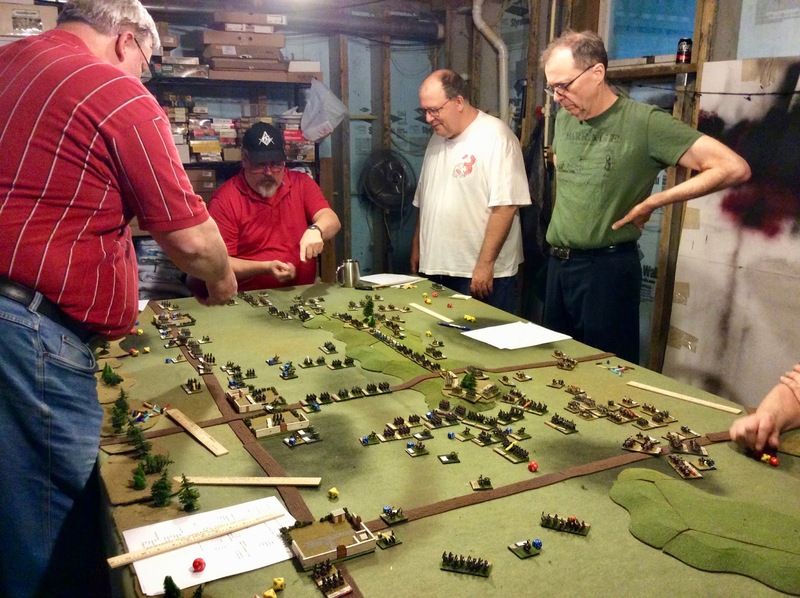 The gamemaster, Jeff Estabrook, had chosen the Battle of Brentford, immediately after Edgehill at the beginning of the war, as the basis of his scenario, and we had a good game of pushing around pike blocks. 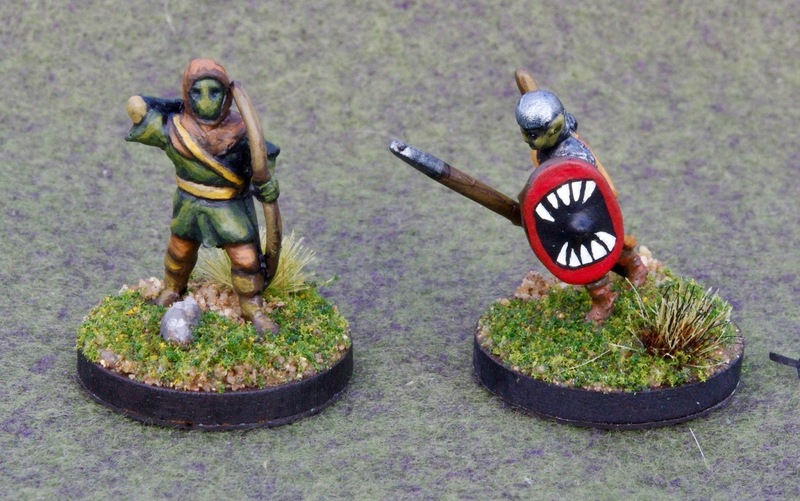 I used to do ECW in 25mm, but sold them off some years ago, figuring that one pike and shot project (40mm 16th century) was probably enough. I think I’ll maintain that resolve, but I was reminded that I like the toy soldier feel of gaming with the big figures. Ross and I set up our game in the after-supper time block. 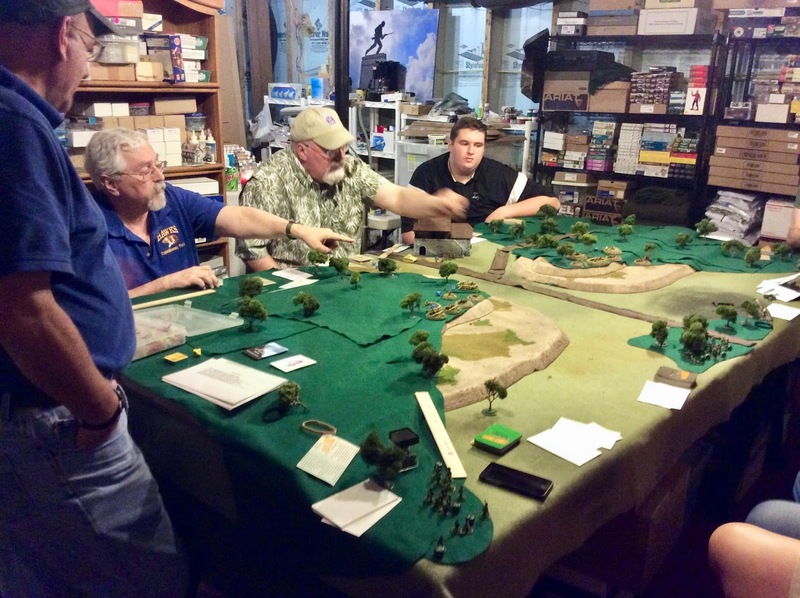 We used a generic scenario drawn from the Stuart Asquith book on solo wargaming, which we set in the 1544 Boulogne campaign, part of Henry VIII’s second French war, and which is more or less the default time frame for our troop collections. 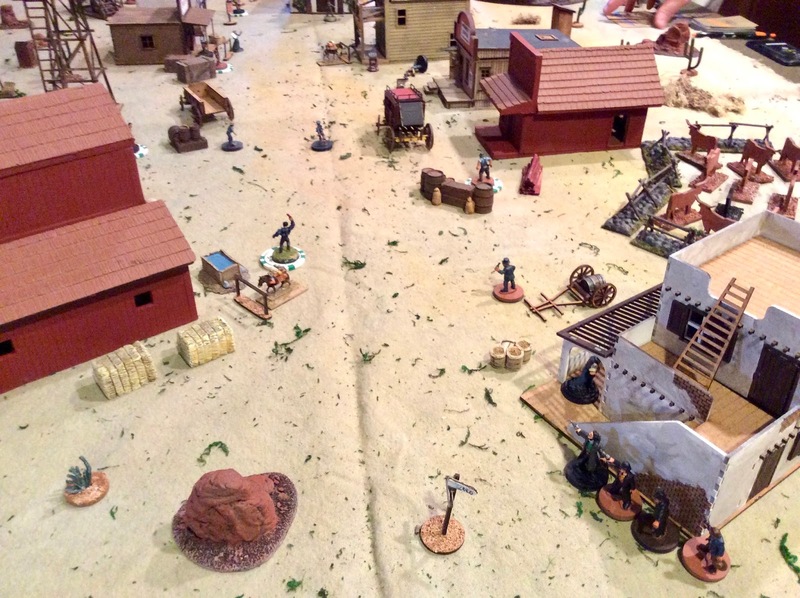 The scenario involved two forces on converging paths, each tasked with holding a village and exiting troops off a single road on the far side of the field. Our forces were somewhat asymmetrical, with the French being heavier, and the English (and allies) being superior in firepower. I thought the game went well, with all of the players remaining actively engaged right up to the end at the four hour mark. The French were edged out of the village and blocked from exiting, but it was a near run thing in both cases. Ross ran an impromptu demonstration of Bob Cordery’s Portable Wargame rules in the Saturday morning block, and I had a go at evicting the British from Zululand a couple of times, using an eclectic mix of 54mm troops from Ross’s collection. Forces ranged from A Call to Arms plastic Zulus to 80 year old vintage Britains, recently restored and repainted. I already have a copy of The Portable Wargame, so happily I’m ready to try this at home, perhaps using some troops that haven’t been out in a while. 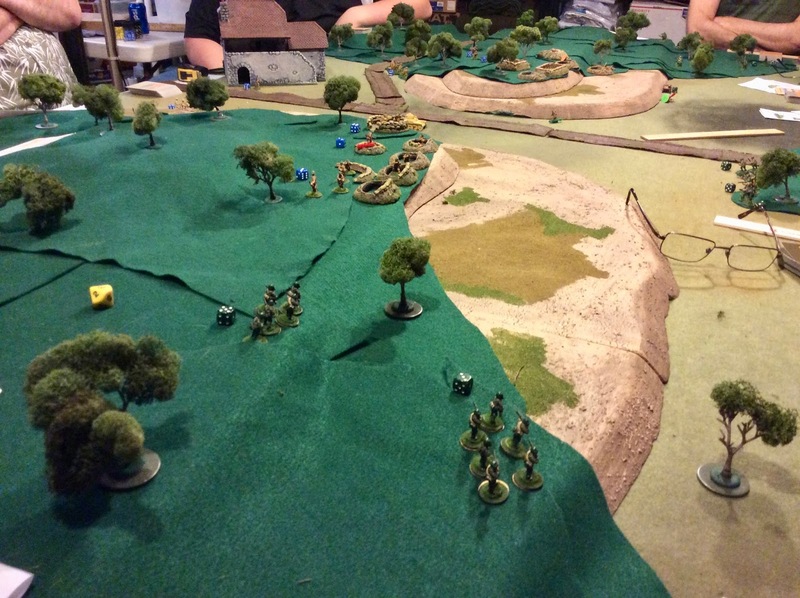 Rob’s army advances; my RAFM Reptiliads are helpless. I had not preregistered for anything for the convention (see comment regarding life stress above), so the Saturday evening games were pretty much closed out. 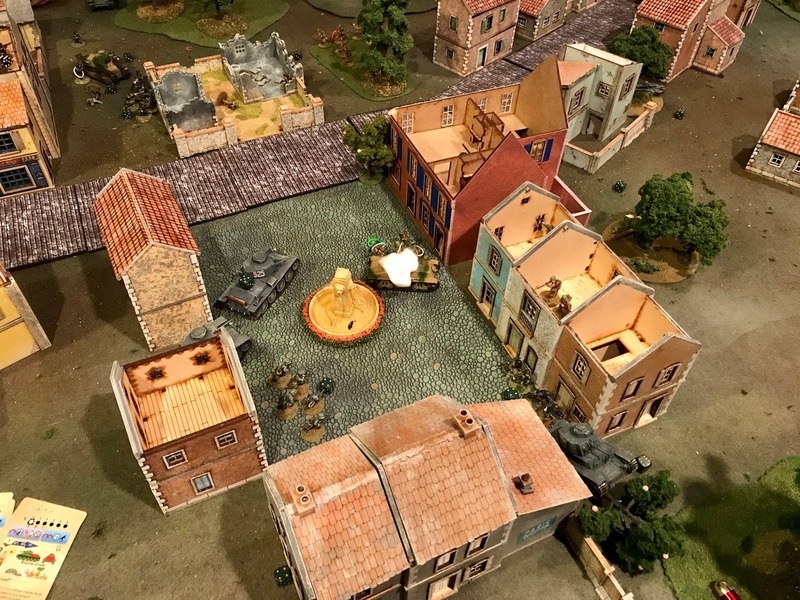 Therefore Ross, Irene, and I had an unhurried dinner at a steak place across the street, and then came back to set up a pickup game of Hordes of the Things, using the 1/72 scale plastics we had brought. Once again, my skills were wholly inadequate to the situation at hand, and my army was sent packing with a 6:1 loss ratio by Ross’s barbarians (built from a mix of Revell Saxons, Orion Vikings, and the classic Airfix Ancient Britons). 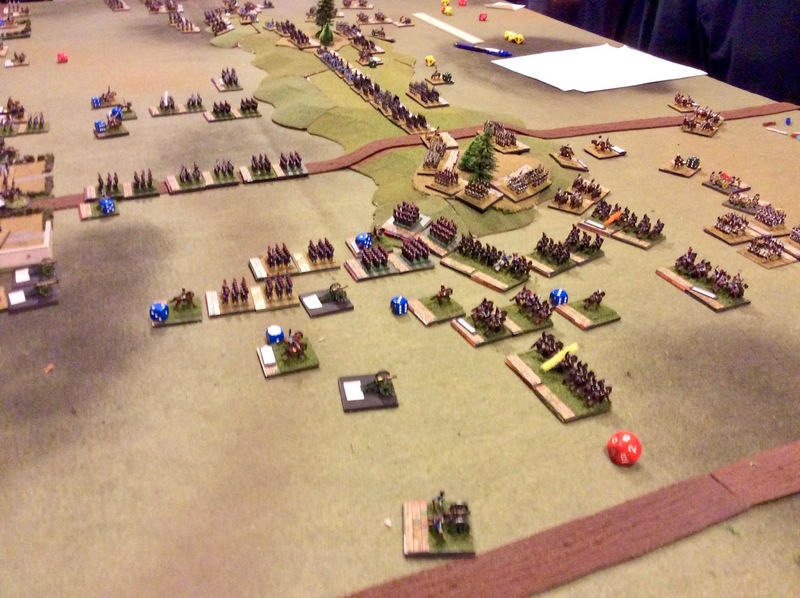 Ross did a reprise of the Portable Wargame on Sunday morning, so I had a quick session using Russian Civil War figures against fellow HAWK Duncan Adams, before heading out for the long drive home. Huzzah remains a great local convention. I was glad to be back this year, and look forward to attending again next year, although I might be a little more proactive about registering for games in advance. I prepped the figure in the usual way; soaking the pieces over night in a dish of water with a couple drops of dish-soap added, then giving them a light scrub with a soft toothbrush, and then rinsing and drying them. I then assembled the model using Gorilla superglue. When the superglue was set, I tested the fit of the mounting hole in the model with a spare Reaper CAV flight stand I had, and was very happy to see it fit perfectly. I began by painting the front of the “Sharktopus” with Americana “Shading Flesh”, an the rear of the figure with Americana “Wedgewood Blue”. I then made a mix of the two paints and carefully blended the front and back colors together. Next, I painted the underside of the tentacles with Americana “Mocha”. I let everything dry for a while, then gave the entire figure a wash with Citadel “Nuln Oil” wash using a wet brush. I then drybrushed the front part of the figure with first a Reaper Free Sample color that was a nice Salmon hue, and followed that with some Folk Art “Almond Parfait”. I then drybrushed the back of the model with Crafter’s Acrylic “Tropical Blue”. I then painted two lines running down the tail, one above and one below the circle indents, using Folk Art “Metallic Emerald Green”. After that, I painted the circle indents themselves with Folk Art Pearl “Aqua Moire”. I then moved to the eyes, painting them a mix of Crafter’s Acrylic “Orange Spice” and Ceramcoat “14K Gold”. Next, I drybrushed the underside of the tentacles with Crafter’s Acrylic “Light Antique White”. I then went back and gave the circle indents a wash with some Iron Wind Metals “Medium Blue” ink using a wet brush. I then returned to the eyes, and painted White pupils, and then gave them Black centers. When the ink wash was dry in the circles, I repainted the center of them with the base “Aqua Moire”. I let the figure dry overnight, and the next day I gave it a coat of Americana “DuraClear Matte” varnish. Since this has a slight sheen to it, rather than being true matte, I decided to go with just this as my final coat. I did however go back and paint the eyes with Americana “DuraClear Gloss” Varnish to give them an extra shine. Space tank and some alien infantrymen coming out of a transport ship. In a previous post I showed a work in progress of some silver space ships that are meant to be evocative of the ship from The Day the Earth Stood Still. A few folks have asked for some more details on how they were constructed. I started with a microwave steamer meal. After eating the meal, the outer bowls went through a cycle in the dishwasher to make sure they were thoroughly cleaned. I used a paper plate that matched the diameter of these bowls for the lower hull. The bottom of the bowl, which will be the top of the space ship, has moulded writing on it. I cut a piece of stiff cardboard from a microwave popcorn box to match the diameter of the top of the ship. I tried card stock and other materials, but even when I sprayed both sides of the top piece, it still seemed very susceptible to warping due to gluing and humidity. Best would probably have been sheet styrene, but I didn’t have any large sheets of it handy. The three main pieces of the space ship body. The feet of the space ship were made of a washer, a disk magnet, an end to a coaxial cable. I was able to get a pack of ten of these cable ends at Lowe’s for a couple of dollars. I glued three washers to the bottom of the paper plate. This was so that the legs could securely connect to the bottom of the ship but were removable for storage. Space ship legs before painting. Then I took all the parts outside and sprayed everything black. After the black paint had dried, everything was sprayed silver. In the picture (above), you can see that I cut a doorway in one of the space ship upper hulls. In the picture (below), you can see three legs attached magnetically to the bottom of the ship. Lets magnetically attached to a lower hull. The final space ships are not glued together. By keeping all the parts separate, I can easily disassemble them and nest them for storage. Two views of the final space ships are below with one of Mark Morin’s space tanks and some 28mm Slave2Gaming aliens for scale. I like the look of the open hatchway and the ramp made of think card. This past Saturday we once again got together for our monthly Frostgrave campaign game to play the 4th scenario of the The Thaw of the Lich Lord – The Storm of Undeath. Once again real life interfered and we only had 5 players. We scaled the scenario to accommodate multiple players, placed the treasure, skeletons, and random drew for starting locations. As Bemis and his warband left the comfort of their library base, snow was lightly falling. By the time they reached the ruins of the old city, the snowfall had intensified and visibility was greatly reduced. Today Bemis was going out to investigate rumors of increasing undead activity. Lately, it did seem like an aura of necromantic power was getting stronger. Additionally he reading through some old journals he had determined the location of magic tome hidden in an old cemetery (Reveal Secret). The cemetery was located near some ancient columns. The columns themselves were wrapped in mystery and wild claims of unnatural power. Many of these rumors had persisted for hundreds of years even though no one had actually seen the aforementioned columns in recent times. Bemis was able to confirm some of the stories through reading and studying the old tomes and scrolls found beneath his library. That coupled with a partial map of the old city gave him a reasonable level of confidence in today’s outing. Bemis and Agarn had prepared well by successfully writing scrolls. Both were also able to summon their familiars, a honey badger and a beaver (Two successful casts of Familiar). With these and the items taken from the vault (Scroll Drain Word and Scroll Time Store), his warband was well equipped for the day’s activities, or so he hoped. Nigel had assisted with drawing up an exploration plan. The newly fallen snow helped muffle the sound of his warband moving through the outer ruins. Although if you listened carefully you could discern the occasional clinking of various weapons and gear carried by his associates. Having reached their rendezvous point, Bemis and the lads prepared to move into the search area. The snow had gotten a big heavier and the wind was beginning to pick up. As they entered the old cemetery, Agarn rooted around until be found an old rusted chest half buried in a crumbling stone wall. Before he could pick it up, he noticed a lot of movement in the ruins to their front. Bemis had also noticed the movement of a rival warband but that is not what had his attention. Occasionally, when he was out in the frozen ruins, he had started to feel a strange necromantic tingling deep in his brain. Like a presence lurking just on the edge of reality. Were the rumors about a Lich Lord actually based on fact? Was this Lich on the cusp of breaking into the real world? Bemis knew he would do anything to prevent such an occurrence from happening. Maybe these columns demanded personal investigation. As he focused on the square formed by the columns, he detected scattered piles of bones and four chests laying in the snow. Something strange had happened here. The scene had the appearance of a group of explorers who were simultaneously killed while carrying off items they had looted. How long ago this may have happened could not be ascertained. The odd part was all of the piles of bones were within the square formed by the columns. The slight taint of necromantic sorcery was getting stronger, and it appeared to emanating from the columns. Bemis then spotted Chaffarn on the other side of the square. That cursed demon lover was here today. Bemis started his warband moving forward towards the columns by casting Fog into the square to cover their movement from Chaffarn. Nigel, Vale, 9Toe, Diesel Vin, Kleppo, Niko and Piko all moved towards the square. Hatch and Shadow moved off to the right to explore. Agarn forgot about the chest in the cemetery and moved up as well. He decided to hinder Chaffarn by attempting to cast Drain Word but he twisted some of the words and his incantation failed. Agarn then read the spell from a scroll and a rune of Telekinesis appeared in the cloudy sky. Nigel and 9Toe quickly moved forward and picked up two of the chests, trying not to step on the piles of bones. They could hear footsteps and whispering on the other side of the fog. Nigel waved Vale, Diesel, Niko and Piko to move up. Having moved forward a bit, Bemis decided some more cover was needed. He once again spoke the words for Fog to appear but stepped on his robe and was distracted – the Fog dissipated in his hands. That’ll teach to try and cast while walking. “Agarn, some assistance lad” and pointed into the square, “Fog if it would not be too much trouble”. Agarn complied and in short order, another bank of Fog was protecting them from Chaffarn’s view. Over to the right, a crossbow bolt skips off a stone wall, barely missing Shadow. This caused Hatch to look around for the shooter. He doesn’t see him but he does see one of Quail’s men and a dog reach the cemetery wall. They must be trying to sneak up behind us. Hatch whistled to get Agarn’s attention and points out the pair. Agarn says “Oh no, they’ll find the chest”. He picks up a chunk of ice and speaks the cant to turn it into a deadly projectile (Successful cast of Grenade). He throws it towards the two intruders. The ice explodes throwing shards into the face of Quail’s treasure hunter(potential thief) cutting him pretty good (7 damage). The dog escapes injury. Hatch yells at Shadow, “Sic ‘em boy” and runs towards the cemetery to assist. Shadow takes off at a full run and barrels into the treasure hunter. The treasure hunter must have been a bit angry from the ice shards and struck Shadow with e tremendous blow to the head. The poor thing crumpled to the snow never to arise. With that, the treasure hunter and Quail’s dog hightailed it back towards their warband. Agarn breathed a sigh of relief, “Bemis would have been furious if I had lost that chest”. ﻿A flash of green lightning appeared off the right, along with a tingling sensation. Some strange sorceries were afoot. The sounds of fighting off to the right could be heard in the wind. Quail and his bunch must be getting stuck in over there. Chaffarn’s demonic dog moved around the fog bank and was sniffing at the piles of bones. Bemis threw up another wall of Fog as additional cover. The rest of the warband drags the treasure back. Agarn successfully cast Telekinesis even though the Drain Word affected his mental faculties. He strained so hard a slight trickle of blood came from his nose (pushed the spell for 6 points). The chest moved towards Hatch and dropped at his feet as Agarn fell against the cemetery wall for support. “Go” he weakly called to Hatch. Getting the message, Hatch swiftly picked up the chest and headed out. There was another flash of lightning and all four columns momentarily lit up which blazing runes. Green energy arched throughout the square making everyone wonder what was happening. Bemis knew an unseen force was trying to channel the power for some foul arcane purpose. Suddenly no one had time to wonder as the piles of bones began to manifest into armored skeletons. Two of the bone piles animated into skeletons on Bemis’ side of the fog wall. Vale was first to react, his Sword of Undead Slaying undoubtedly giving him an edge. He easily sliced through a skeleton reducing it back to pile of bones. Diesel and Nigel engaged the second skeleton with Nigel getting in the killing blow. Seeing a skeletal arm poke through the fog, 9Toe and Piko move to protect Bemis. They engage the skeleton but fail to cause any damage. Agarn moved to look around the fog and spied more skeletons. He grabbed a chunk of ice and quickly, and accurately spoke the words for Grenade. He throws the chunk of ice but the shards fail to cause any damage. Another skeleton joined the fray forcing 9Toe and Piko to each engage in single combat. Nigel’s endless sessions with the sword proved their worth; both managed to defeat their undead opponents. Just as things are going well, one of the fog banks melts away exposing a scene of carnage. One of the newly arisen skeletons has managed to slice its way through three members of Chaffarn’s warband – a warhound, a summoned imp, and a treasure hunter lay in the snow around the undead creature. Bemis rushes his incantation to cast Grenade at a fleeing Chaffarn. Agarn throws up another Fog wall to prevent retaliation from Chaffarn. Before Nigel or the others could react, the dead treasure hunter struggled to a standing position and turned towards Nigel. His eyes were red and his movements seemed forced. Could this be a revenant? Bemis had read about such creatures. His musings were cut short as the undead treasure hunter launched itself at Nigel. Nigel was caught off guard but his reflects saved him. He managed to deflect the creatures sword thrust from anything vital but took a tremendous gash in his side that nearly dropped him to his knees (10 points of damage). Nigel reached into his bags of tricks (Used Captain’s Trick Furious Attack for +3 Fight) and quickly changed the direction of his thrust, killing the undead treasure hunter – for good this time. While this was happening, Vale engaged the skeleton but was unable to cause any damage. Nigel, still feeling weak, moved to assist Vale as did Diesel Vin. With the skeleton distracted by the other two, Nigel quickly lopped its head off. Bemis sees Chaffarn’s Man-at-Arms attempting to flee the area. Not quite sure why, but he attempts to Transpose Man-at-Arms with Diesel Vin. Bemis successfully managed to cast the spell and both figures started to fade out. But as quickly as they started, they both re-materialized in their original locations (The Man-at-Arms made a successful Will roll). Agarn seeing what his Master had attempted decided to try his luck. Before Bemis could stop him, he concentrated hard and managed to cast Transpose (boosted it 3 points to 21). The man at arms failed to exert his will and suddenly found himself surrounded by members of Bemis’ warband. Too late did Bemis and Agarn realize the henchman was actually possessed by some kind of demon entity (Chaffarn had cast Possess earlier). Nigel, 9Toe, and Vale all tried to bring the beast down. Nigel and Vale took severe beatings in the process and the possessed monster managed to get away. 9Toe decided to help out his friends instead of chasing the foul creature; with Diesel’s help, they managed to get them to safety. Agarn was relieved that they would make a full recovery. Of course Nigel would have a few choice words for the two wizards once he had recovered. Bemis cast one final Fog before withdrawing. This time he made it out with all his band except Shadow who remained behind in an icy grave. Like he always does, Bemis spent some time rummaging around through all the old documents, scrolls, and tomes in his library home. He didn’t discover any magical writings (failed the Library roll) but he did managed to learn of the location of a great under ground library (Absorb Knowledge). Bemis was all excited, this must be the same library referenced by the great Druid Knabe in his annals. The chest from the cemetery contained a grimoire titled Homunculus. Bemis wasn’t sure what to make of it so he stored it in his vault for later consumption. The other chests contained two more tomes, grimoire’s of Summon Demon and Decay, 200 gold coins plus a rolled up banner (Banner of Courage). Grimoires are always a favorite of Bemis. Maybe the banner could be sold. Spell wise this was a much better game for Bemis. He and Agarn managed to cast 11 out of 15 spells (110 xp). As a warband, they killed 5 skeletons (10 xp each) and 1 revenant (20 xp). This added to the 200 xp from the 4 treasures, 50 xp for being in the square when the lightning struck, and the 50 xp from Absorb Knowledge gave Bemis 480 xp for the game. As for wandering monsters, we ended up with 2 frost trolls, 2 rangifers, a small construct, and 1 wraith – all came in at the far end of the table. They had a good time playing with Quail’s, Missy’s and Alfred the Unready’s warbands. If you have read Chris’ report, then you know Quail’s issue with generating offensive firepower as a Sigilist. Bemis being a Sigilist also lacks offensive spells, except for Grenade, plus he doesn’t have any archers or crossbowmen. This means he has to be a bit more creative in how he approaches each adventure. I still like the spell Transpose even though things didn’t go well this time. I think used properly, it can be very useful. Well six weeks until our next campaign game – Ugh…..
Chris Palmer A long while back I purchased a cheap secondhand Games Workshop “Skull Pass” set off of eBay. I painted up a few of the units, but then other projects were pushed ahead of it, and the remainder of the figures were relegated to a shelf. 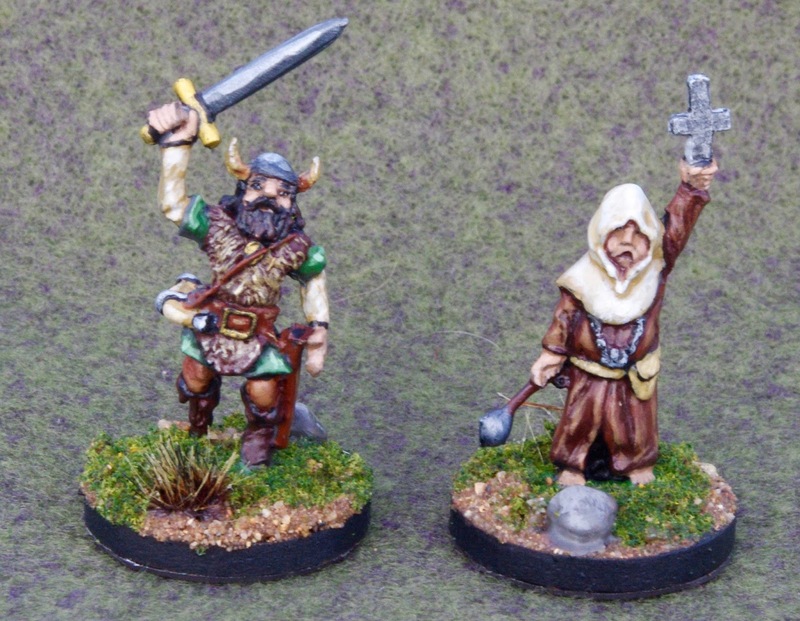 A few years passed, then recently I saw some photos of someone who had painted a few of the units, and I was reminded how much I had liked the Dwarves from this set. It had always seemed to me that there was just a lot of character crammed into these simple imaginative single-piece sculpts. So, in a bit of a nostalgic frame of mind, I pulled out a unit of the Miners, and prepped them for painting. These figures are beautifully designed for block painting, (ideal for beginners), with lots of deep crevices to separate parts and colors, so I tried to do a mix of block painting style and more detailed washes and highlights around the face and hair and a few other places. I also had an extra Miner figure, off whom I had borrowed the axe to make my Yukon Cornelius conversion, to which I added a spare Ogre weapon to make it look like some kind of special hero figure. I really enjoyed painting these guys, and I just might pull a few more figures from the box to work on this Summer.